When building our garden, the front-entrance terrace was one of the initial projects that I took on, right after completing the terrace in the back. 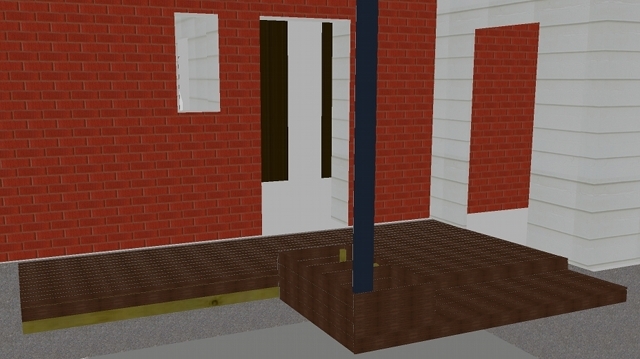 I modelled the front-terrace using Google SketchUp, providing me with a means to calculate material needs, visualise the result and as blueprint during the work. I actually showed the model to my neighbour before starting the work and asked him if he would be OK with the design. I built the front-entrance terrace following the same pattern as for the terrace in the back: digging to the depth of the concrete slab foundation, placing and levelling the slabs, fixing the supporting beams, creating a 10% sloping gravel plane to drain water away from the house’s foundations, fixing the top layer beams of the framework and then the decking boards. There was a one-step stair that I needed to build with the decking, I opted to just leave out the top framework layer for this 60 cm x 2 m area. There is also a post supporting the roof that protects the entrance area, with a rather ugly concrete foundation rising about 30 cm above the level of the step. For this I had design to build a 60 cm x 40 cm sized box out of decking board high enough to cover the ugly concrete bit. The box has the second purpose of proving a side wall for the step, rising higher than the terrace. To make it look less of a strange design feature to hide something and more like a purpose-made add-on, I left an area in the box open that could be used for plants. We ended up putting pretty stones there, as they do not need maintenance. We learned, however, that small children love to pick and throw those stones… Originally I had planned to have the terrace narrower and a larger area for the flower bed, but my neighbour talked me into making the terrace area larger, and I am glad of it as now we have a front terrace were I can sit in the morning sun, when the back garden is in shade. To tie the flower bed into the front area, I framed it in using decking board. After thoroughly planning the projects, it was time to get stuck in. I had been planning all winter starting after Christmas, therefore the timing for starting project work was pretty obvious: as soon as the snow was gone and it would be warm enough to work outside. I thought I would be starting with the terraces, but although I had the decking board already in early April, first it was too cold, and then we had agreed with the neighbour to build the fence. Once the fence was completed, I started to work on the terrace in the back. Next, I built the front-entrance terrace following the same pattern. 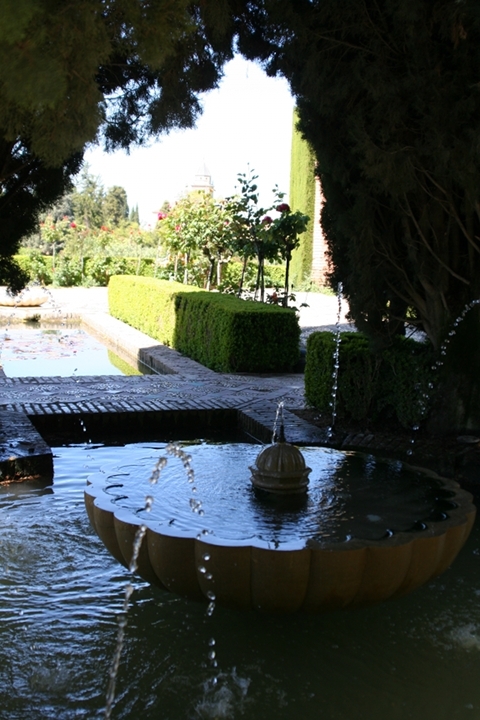 Before I had really started with the terrace in the back, we went on holidays to Andalusia in Southern Spain and visited many gardens, including the Alhambra and many courtsyards in the Cordoba courtyard garden competition that is carried out there every year end of May. We picked up two new requirements for the garden from this trip: we wanted an ornamental water feature making “refreshing splashing noises” and at least some ornamental paving. We integrated both of them into the path at the side of the house, adding a large circle half-way with a water feature in the middle to the design. With all decking areas done, I started to use the earth removed from the decking area to level out the area for the new lawn. I marked the path and the circle area and dug up all earth from where the path would be and from the paving area. The excess earth I used to raise the beds along the path, overall we significantly raised the garden as the level lawn required hight adjustments of up to 40 cm and I had to even out the slope of the path that this height difference created. I did not have much of a plan for this landscaping and made it up as I went. I used cheap timber boards to separate earth from areas that needed gravel for proper drainage, mainly a 30 cm wide bed of coarse gravel along the house, so that no earth would mix and spoil the draining property of the gravel. At this time we had also figured that there would be space to create a small run of a fake brook along the path and that there would be space enough for a small bridge so that the path would cross over the brook. I landscaped this and left a gap in the path where the bridge would go. As with the terrace, I lifted all the earth until meeting the gravel layer from all to-be paved areas. Once this was completed, I ordered a lorry of gravel, that I used to create a well-draining foundation for the paving that will not raise when freezing (as earth does), filling up to create the required height. 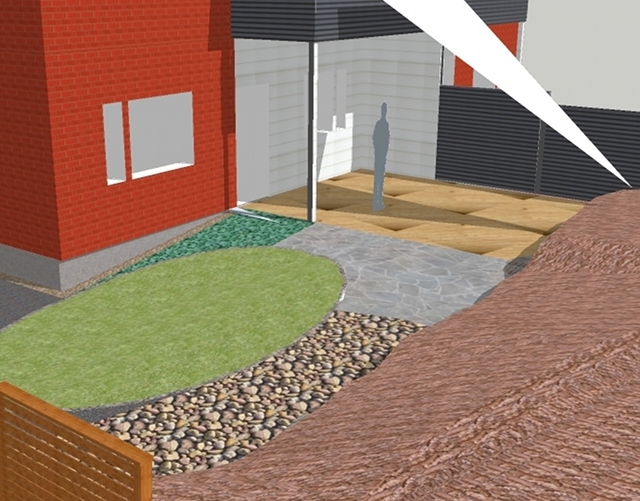 This meant to level the paving area and creating a smoothly sloping path, level at the circle area. Although all literature prescribes to get some sort of heavy roller to compact this gravel layer, I decided against it. Whilst using a wheelbarrow to move the gravel into place, I had very well condensed all gravel along the path. Also, small sinking of path and paved areas would not be so bad, as we were aiming for a natural garden with old feel to it. With the gravel in place and distributed carefully, it was time to order the slate paving and the paving stones. We had decided on using white and dark granite in alternating rings for the ornamental circle. I also ordered stone-ash for bedding the paving on and also to be used as gap-filler between paving stones. Using water-permeable sheet, we covered the gravel and spread a 5 cm layer of stone-ash on top. The sheet prevents the gravel and stone-ash mixing, which would mean that the stone ash would eventually completely disappear into the gravel. Starting with the paving area next to the terrace, I laid out the largest pieces of slate and added and removed smaller pieces of slate until I got a satisfying puzzle together. Then I eased the slates into the stone-ash positioning them as level as possible. Once all were in place I filled the gaps with stone-ash. Then I hosed the area down so that the stone-ash could settle. Luckily we had some torrential rains at the time that helped to settle the stone-ash even further. I then placed the edging stones of dark granite, for the step from the paving down to the lawn we had bought large granite blocks (of the like used to separate the pavement from the road). For the edges I folded a root-blocking thick fabric into U-shape underneath the edging stones, hopefully preventing grass and bedding plants to spread too eagerly. The fabric I left a bit longer than intended and I would cut it back to the required height later. I did the edging for the entire lawn, in other words, I made a large oval shape. At this point I set out to create the vegetable patch. At that time the area was a large mount of earth. To increase the area and to get sufficient depth, I started tidying the edge of the rock and dead root balls of the large fir tree that was there at the time (it was cut down later by the council to prevent storm damage). There I found a one meter long somewhat obelisk-shaped piece of granite that had been broken of the rock-foundation by water and roots. This I pried loose and moved to the side of the path. I was able to make it stand, and there it still is, the perfect rock feature, just where we had designed one (a heap of stones was in the original design). To manage the height difference between forest and lawn, about 60 cm, I built a wall from the edge of the to-be lawn out of the granite rocks gathered during digging work. I created a small gravel foundation under the wall to prevent expanding frozen earth to tumble the stone wall down every winter. Leaving a 40 cm band of earth, I raised the wall to a second terrace. Then I encircled an area of two meters with rocks and filled it with earth – there was my vegetable patch. Initially the rock wall raised a few eyebrows as it looked rather rustic, but now it is a well-established detail in the garden. At this point I ordered and picked up the roll-out lawn. I evened the earth, but did not roll it, as is recommended by literature. Laying the lawn and cutting the round shape of the oval against the already completed edging stones was as easy as they make it look in garden makeover programs. I must admit that, particularly due to the fact that I had levelled the lawn with recaptured earth and dug-under grass, and that I omitted rolling the site before laying the earth, has resulted in a somewhat uneven surface. Although I had not planned this before, I envisioned the bridge over the brook as being slightly arching. Using concrete slabs as foundation, I took 1,50 m left-over beams from the decking framework and cut a soft arching shape using the electrical jigsaw. Those I screwed onto the concrete slabs and screwed a run of decking boards to them, resulting in a perfectly arching bridge. I paved and edged the path from the lawn to the bridge and from the bridge to the circle. We picked and bought the water feature for the circle and also bought a 60 liter water reservoir. I dug a hole for the reservoir in the centre of the circle and placed the reservoir. I filled the reservoir with water and filled the surrounding gaps with gravel, using water to settling it in. I kept the lid on the reservoir to prevent animals, children and me from dropping into it. Using sheet and stone ash underneath, I started building concentric circles around the reservoir, using an alternating colour pattern . To allow for a cable for the water feature pump, I placed a hard-plastic cable tube under the paving and left a string running through it so that I could later run a cable through it without lifting the paving (I had not decided what pump to buy at this time). 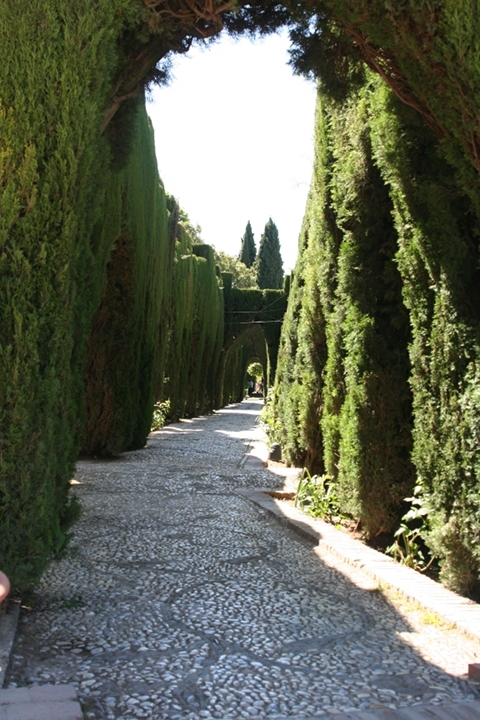 I encircled the ornamental circle with edging stones and continued laying the path all the way to the road. I also used the back granite for lining along the gravel road from the front-terrace to the path (in front of the shed and the bedding at the side of the house) and from the path to where our garden ends and the neighbours strip starts. To take care of the height difference between my garden and the neighbour’s, resulting from my landscaping, I built 10 cm dry wall using the granite rocks that I earlier had dug up, all the way underneath the fence and up to the road. It is one thing to see something that you like in a magazine, book or the internet, and another thing to find a place where you can get it (never mind the price). This is probably were the professional garden designers beat us amateurs, because they will only design with materials that they know they can source, and they probably know how to plan to a budget. This is were for us reality kicked in and we found out the hard way what is the done thing in Finland. Quite frequently in books, but also in magazines we found details highlighted that you cannot get from a Finnish retailer. But I also learned that you can get it, if you really want it, and it doesn’t even have to be expensive. For the decking, I quickly ruled out conifer wood, as I did not want chemically treated material, I had been shown poor longevity of thermo-treated conifer decking by the neighbour of my in-laws and I did not fancy Siberian larch (larix sibirica) that does not need treatment. I also had bad experience with knotholes and splinters in deckings made from conifer wood. This is no easy decision, as Finland is a large producer of conifer decking wood with several companies specialised on thermo-treatment exporting worldwide. In effect this means, that all people I know happily buy Finnish conifer decking wood and look no further. 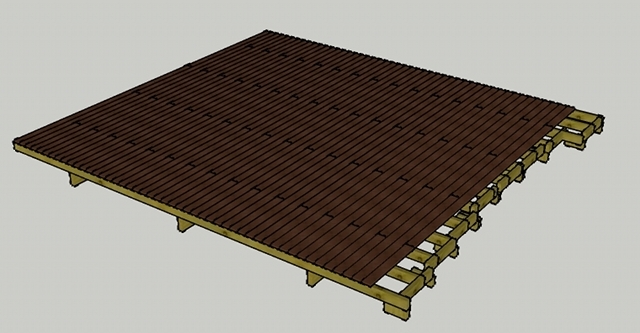 Decking made from imported wood – not the done thing. I also ruled out the plastic-wood mix boards and fully synthetic boards on offer, as I do not like their unnatural look and feel. 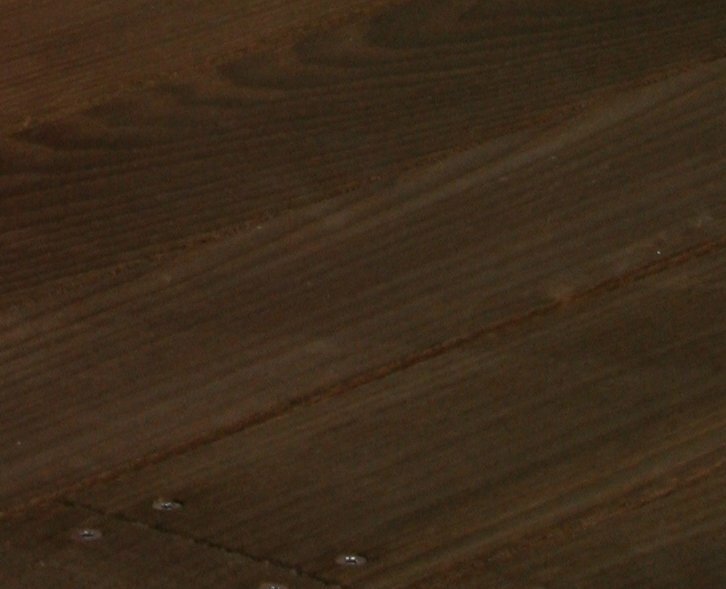 In the internet I came across thermo-treated hardwood decking board and started to trace down manufacturers. I ended up buying thermo-ash from www.brenstol.ee directly from the factory in Estonia – they delivered to my door (very certainly not the commonly done thing). Thermo-ash decking after being laid, untreated. For the paving, we got slates from Orivesi in Finland, this is actually standard stuff here. For edging we got black granite originating from China and for some ornamental paving we got also white dotted granite from Finland. 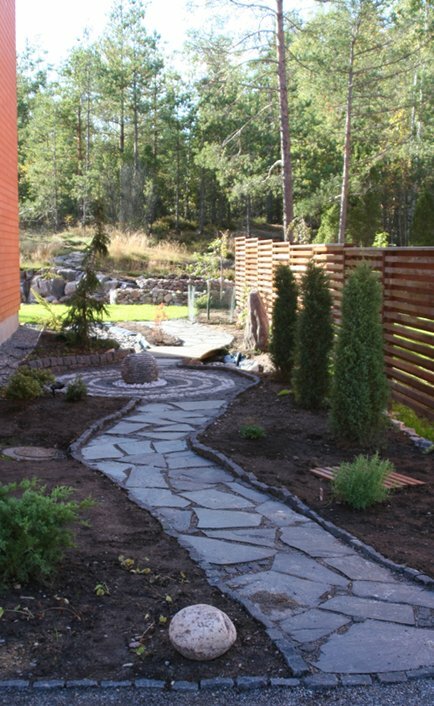 There are plenty of retailers for standard pavings such as slate and granite cobbles here, we bought from Kivikopla. However, I noticed that the mainstream here must be man-made concrete paving stones, as the usual retailer caters a far larger selection of those than natural stone products. There is one exception, www.nyx.fi, which back in 2009/10 did have an unbelievable selection of stock in stone and rock of all kind imaginable. Unfortunately, they were forced to close shop in Espoo for what I understand was a local political plot, and they continue only as a tiny outlet much further out from were I live. I have not visited them since close-down sales. We did not need to order additional earth, as we would reuse the earth from the paved areas and terrace area, I calculated at the time 4-5 cubic meters. Trees we bought all from our local nursery. We took our time for selecting the apple tree and the tree for the terrace, the other trees we selected in the nursery. Today, with my increased knowledge, I would select all trees prior to visiting a nursery or garden center, researching the candidates thoroughly, but as far as I can tell, no damage was done. We did take care to select slow-growing trees though, and I hope we wan’t be in deep shade twenty years from now. The old lawn was not of too great quality and I decided to dig it under and get roll-out lawn for the new patch, as there is a producer just down the road. I tracked down a local lorry company that would deliver gravel for foundations of the path and paved area by the lorry-load. The stone ash to settle the paving into I would buy from the same place where I bought the slate. As I would be doing some height adjustments to the garden, I would also need some small gravel to fill up the drainage next to the walls of the house to meet the new level of the bedding. Sheet for separating gravel and stone-ash, root-blocking fabric and permeable weed-blocking sheet I got from a DIY store. Also tools, screws and other small metal bits I found in local DIY stores easily. Check the local DIY stores, garden centers and nurseries. Also check the gardening and tools sections of large supermarkets. Talk to friends and neighbours, they might know about unique sources (someone willing to part with an excess stockpile, retired craftsmen, the small shop down the road that does not advertise). Check the classified sections of local newspapers. A lot of business is seasonal, therefore small companies spend their advertising budget in the season, here in Finland that is spring and summer. 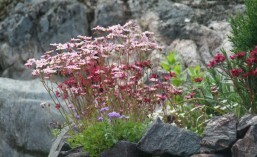 Sales advertisements for gardening supplies are usually out from late summer to autumn. Gardening and building magazines have references in articles, are full of advertisements and may have a classified section that cater for niche markets, usually in the end of the magazine. Some books have also references, but they are often out of date. Attend gardening and building fairs and exhibitions. There you can discover and meet suppliers and see samples. Small products are also sold there. Take the program booklet with you, it contains a list of exhibitors that is a great source for suppliers, also for stuff you were not looking for when attending the event. The website of the fair might also contain a list of exhibitors. Find the name of the manufacturer and find the website. Some manufacturers sell directly from their website, others have a list of retailers that sell their products. They always will have contact information, I have more then once emailed or called manufacturers and found a way to buy their products that was not published on their website. Particularly if manufacturers are abroad and focused mainly on local markets, creativity is needed to find someone willing to take the trouble of shipping overseas. I also have had need to be very creative to sort out a way for payments, as some small companies do not take credit card payments. Try to find the product on www.amazon.co.uk. Amazon sells and distributes goods for a network of shops and manufacturers, and ships such goods for free to nordic countries when ordering for £25 or more. However, Amazon also advertises goods from shops that are sold and distributed by the shops themselves. In those circumstances, shipping will not be free. It is possible to filter out products for which shipping is not free. I also noticed that Amazon sells different goods from different countries, also prices are different. That is easily explained: companies try to reach a certain market through Amazon, so they hook up to a certain Amazon country site. Therefore, when looking for example for goods from a German manufacturer, amazon.de might have a better selection and better prices than the UK site, although shipping is not free to Finland. I have also resorted to having goods shipped to relatives in Germany when they are coming over for a visit. The relatives can bring the goods and I save the shipping costs. Use Google search and price comparison sites to find suppliers. This works well for technical items, but I find it rather tedious to find anything this way for manual items. Use Google image search with the product name. Sometimes the images originate from a web shop or manufacturer. Find forums and blogs specialising in the area. People might be able to advise where to buy or how to build things yourself. Now it was time to plan each project in detail.